Get caught up on Spring Camp with all the interviews from the weekend. The morning of Thursday, May 1st had young hockey players huddled at their computers, checking their phones and waiting for their name to be called at the WHL Bantam Draft. When Regina Pats Director of Scouting, Dale McMullin ascended to the podium to make the team’s first selection (13th Overall) of the Draft, the name called was out of character for the Blue and White. For the first time since the inception of the Bantam Draft in 1990, the Pats selected a goaltender in the first round. 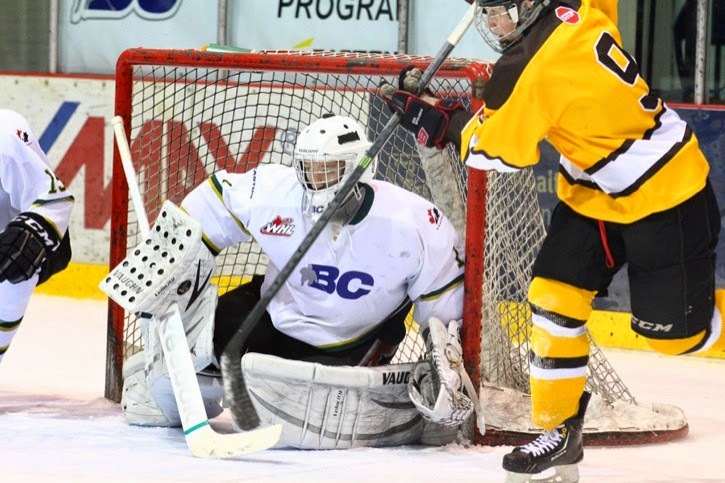 Langley, B.C.’s Jordan Hollett was the second goaltender picked in the opening round. The Pats scouting staff is charged with building the team through the draft every year and for the young players selected it can be a life-changing event. In June of 2013, Morgan Klimchuk heard his name called by the Calgary Flames at 28th Overall in the NHL Entry Draft. It was a great moment for Klimchuk having grown up watching the Flames in the Stampede City. When fall came around and Flames Training Camp on the horizon is first on-ice professional experience would hit a delay as the Pats’ sniper suffered an injury at Pats Training Camp just days before he left for Calgary. Klimchuk returned to the Pats for the beginning of the WHL Regular Season and went on to post 74 points (30G, 44A), just two points off his career high despite only playing 57 games in the 2013-14 campaign. He also added five points in four playoff games against the Brandon Wheat Kings. With the Pats season at an end, Klimchuk journeyed West to join the Flames’ AHL affiliate Abbotsford Heat for what would be the teams’ final games before departing for Glens Falls, New York this off-season. Before he could get into action with the Heat, Klimchuk was sidelined with a minor injury to once again delay his debut. The Pats’ leading scorer set aside frustration to take advantage of the extra time to observe how the game works at the pro level. 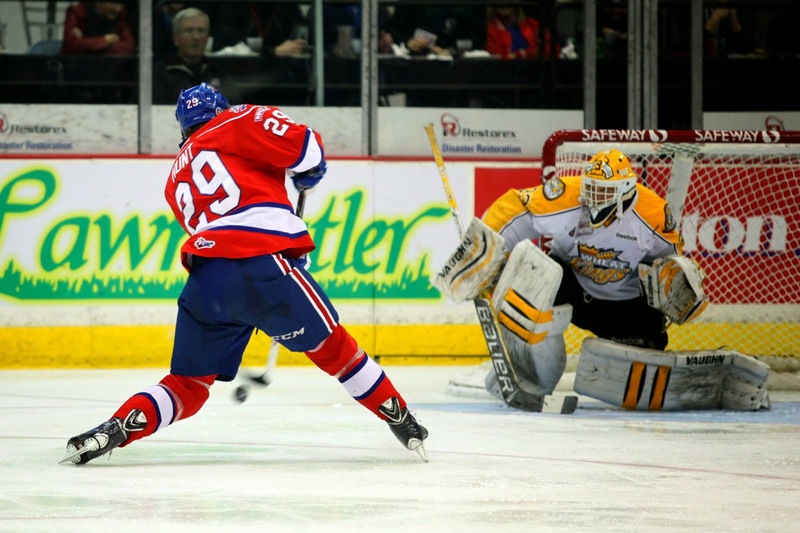 The Regina Pats season came to a disappointing end when they were swept from the WHL Playoffs by the Brandon Wheat Kings. With that end came new beginnings for several Pats players as they joined their NHL affiliate AHL teams on Amateur Tryout Contracts. Pats Captain Kyle Burroughs, a 7th Round selection of the New York Islanders, was the first Pat to get into professional action this spring. 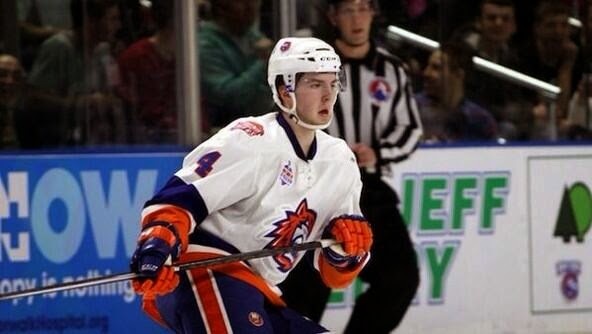 He suited up with the Islanders’ affiliate Bridgeport Sound Tigers. Just six teams remain in the quest for the biggest prize in Canadian midget hockey. The Okanagan Rockets, Halifax McDonald’s, Prince Albert Mintos, Toronto Young Nationals, Grenadiers de Chateauguay and host Moose Jaw Generals will all clash next week to raise the Telus Cup as Canada’s National Midget Champions. One Regina Pats prospect knew he would be participating in this tournament when the season got going and hopes a year of work will soon pay off. 2012 3rd Round Bantam Draft pick and signed prospect Rykr Cole is a member of the hosting Generals. Cole and his teammates are the most rested of the squads after bowing out of the SMAAAHL playoffs in their first round matchup with the Regina Pat Canadians. When the Generals open the tournament on Monday, April 21st, it will be the first time the hosts have seen true game action in 45 days since their playoffs came to an end March 7th in Regina. Cole registered two points (1G, 1A) in four playoff games this year after finishing second on the Generals during the season with 45 points (23G, 22A) in 41 games. 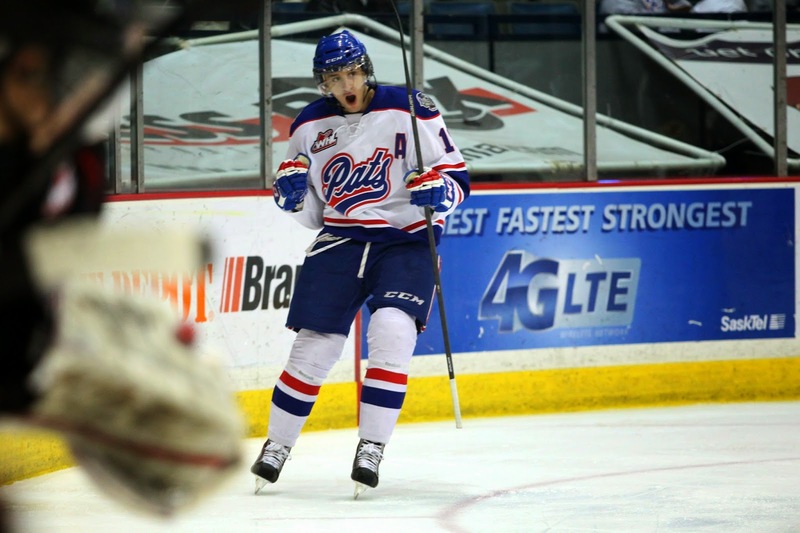 Regina, Saskatchewan – Regina Pats forward Dryden Hunt moved one step closer to realizing his dream of reaching the NHL today. The 18-year old forward jumped onto the Central Scouting Service’s final rankings for the 2014 NHL Draft. "Not being on it all year, and then finally at the end of the year with the last rankings I'm on it... feels pretty good," said Hunt. "Obviously there are some special players on that list so to be on that list it's pretty cool. After not being on the list for the two prior ranking sets released, Hunt comes in at 144th among North American Skaters. Though the rankings are theoretical and don’t truly affect the draft, it does mean the Nelson, B.C. native turned heads with his play this season. Becoming a Memorial Cup Champion, the first CHL Player of the Year and an NHL Draft pick are just a few of the highlights of Ed Staniowski’s hockey career. One of, if not the, greatest goaltender in Regina Pats history, Staniowski’s number “1” hangs at the West End of the Brandt Centre among other Pats legends. Out of all the achievements of his hockey career, Staniowski joked with Pats play-by-play man Phil Andrews that there was one thing missing. Staniowski was back in Regina for his bobblehead night presented by Knight Archer Insurance. The collectible was made in the likeness of Staniowski in his Pats’ days, meaning it bore some distinct differences from the 58-year old Moose Jaw native. The trademark grin was unmistakable though as Staniowski took time to sign autographs for a massive line of fans who, by the end of the evening, had donated over $3,000 dollars to the Soldier On fund in support of returning wounded veterans. Media and Communications Director for the Regina Pats Hockey Club as well as Colour Commentator for all Pats broadcasts on 620 CKRM. The thoughts on this blog are exclusively my own and do not represent the views of the Regina Pats or Harvard Broadcasting. To read posts from December 2010-March 12th 2012 click here.